Kurdish activists have blocked Hyde Park Corner in central London in protest against the killing of 60 people in a Turkish airstrike on the town of Cizre on Monday. Turkish state media claims the strikes launched were aimed at Kurdish Workers’ Party (PKK) fighters. UK-based activists took to the streets to oppose Turkish military action. Others on Twitter accused the Turkish state of “ethnic cleansing” against Kurds. The protest is the latest in a series expected to take place over the coming weeks. 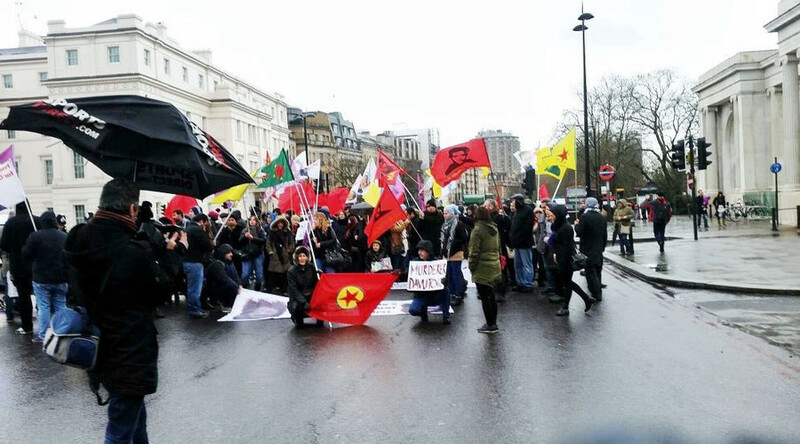 On March 6 a nationwide demonstration has been planned by the Kurdish National Congress UK, Peace in Kurdistan and London Kurdish Solidarity groups. They claimed “an all-out policy of annihilation” was being pursued against the Kurds by Turkish President Recep Tayyip Erdogan. They also called on the UK government to “decriminalize the Kurdish Liberation Movement,” arguing that “even though the PKK represents the vast majority of Kurds in Turkey and in the UK” it remains illegal. The Kurdish People's Protection Units (YPG) took full control of the Syrian border town of Kobane late last June in a powerful show of Kurdish resistance. Erdogan lashed out at the Kurds on Monday after a meeting between US officials and members of the YPG. A delegation featuring Brett McGurk, the United States’ envoy to the coalition against Islamic State (IS, formerly ISIS/ISIL), met the group over the last weekend in January. “He [Brett McGurk] visits Kobane at the time of the Geneva talks and is awarded a plaque by a so-called YPG general?” Erdogan told reporters on his plane while returning from a trip to Latin America and Senegal, the Beser Haber newspaper reports. “How can we trust [you]?” Erdogan said. Ankara considers them to be part of the PKK, banned in Turkey as a terrorist group.